Map of the proposed route for a sea-level canal, 1879. From Congrès international d’ètudes du canal interocéanique, Paris, 1879. 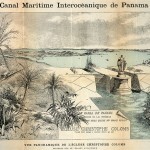 The International Congress for Study of an Interoceanic Canal met in Paris in 1879, to consider various proposals for a canal across the Isthmus of Panama. 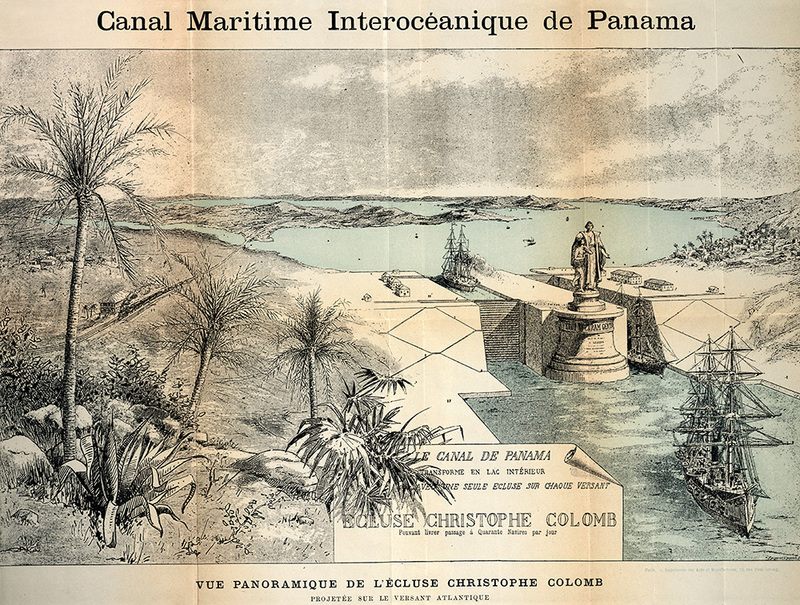 The plan that ultimately won the approval of the Congress and of Ferdinand de Lesseps was that presented by Lucien Wyse and Armand Réclus for a sea-level canal in Panama. The canal closely followed the existing route of the railroad. Once approved, Ferdinand de Lesseps acted quickly to set the plan in motion. Ultimately, the sea-level plan doomed the entire French effort. 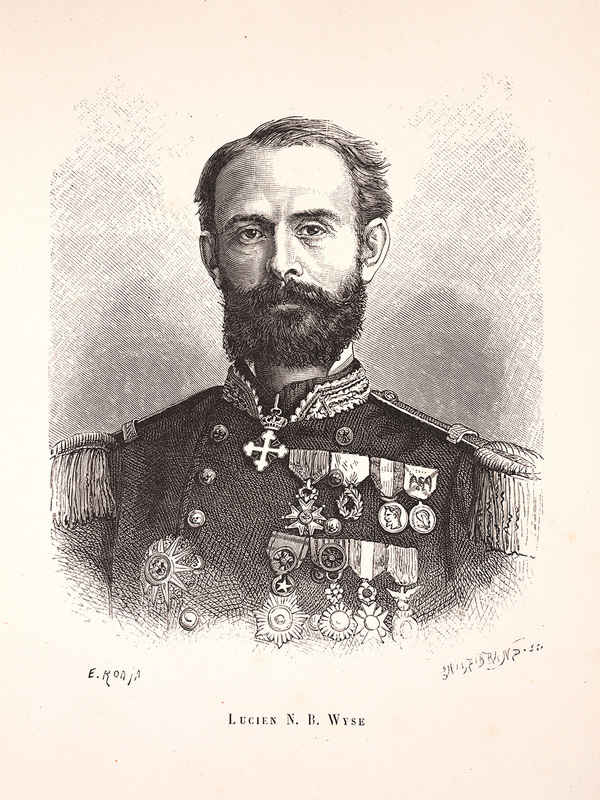 One plan that received almost no attention was proposed by the chief engineer of the French Department of Bridges and Highways, Nicholas Joseph Adolphe Godin de Lépinay. Not only did de Lépinay know something about engineering, he had experience with construction in the tropics. A sea level plan, he said, was completely unrealistic. His plan called for sets of locks which, like stairs, would lead to two man-made lakes. The lakes would be created by dams, one on the Atlantic side at Gatun to control the Chagres River, and the other on the Rio Grande on the Pacific side. The lakes, with surface levels 80 feet above sea level, would be joined by a channel dug through the mountain ridge at Culebra. Ironically, the main points of this rejected plan were essentially the same as those in the final American plan for the canal. Portrait of Lucien N.B. Wyse. From his Le canal de Panama. Paris, 1886. 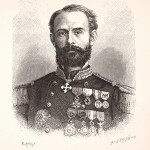 In 1876, French Navy Lieutenant Lucien N.B. Wyse explored the Isthmus of Panama on assignment from the Société Civile Internationale du Canal Interocéanique de Darien. His resulting plan for a canal with locks and tunnels was rejected by the head of the Société Civile, Ferdinand de Lesseps, who sent Wyse back for a second survey in 1877. During that trip, Wyse traveled to Bogotá, where he negotiated a treaty with the Columbian government. It was signed on March 20, 1878, and became known as the Wyse Concession. It gave the Société Civile exclusive rights to build a canal through Panama and a 99 year lease. After his second reconnaissance, Wyse recommended a plan for a sea-level canal which, he knew, was the only one that de Lesseps would accept. Panoramic view of a proposed lock for the Atlantic side of the canal. From A.B. Nichols Notebooks. The alternative to a sea-level canal was one that used locks to raise ships from sea level to the level of an inland lake that would be created by a dam. An artist’s rendering of one of the later French plans envisioned two very high locks, side by side, with the statue of Columbus placed as a colossal sentinel at the top, towering above the tall masts of the ships. 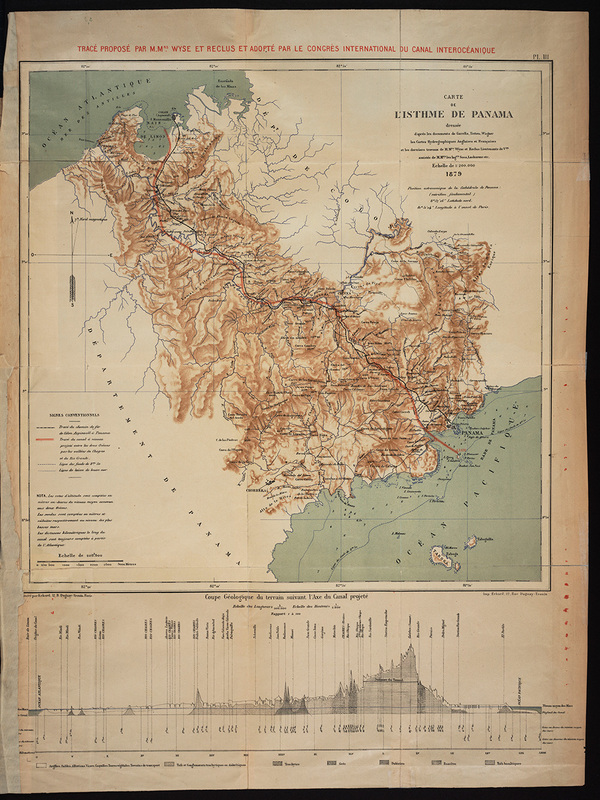 The original plan presented by Lucien Wyse and Armand Réclus in 1879 to the International Congress for Study of an Interoceanic Canal called for a tunnel through the mountain ridge at Culebra. A.B. 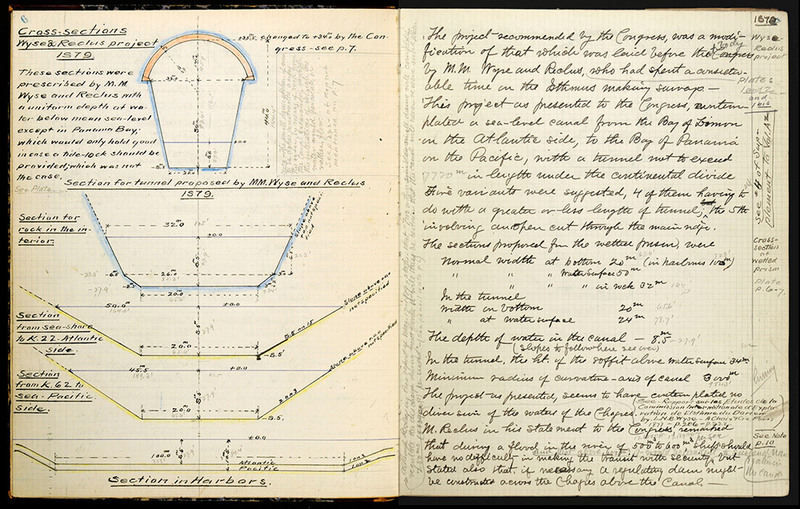 Nichols made a thorough study of that plan, with technical drawings that show cross sections of various points on the canal as originally conceived by Wyse and Réclus. The section at top left shows a cross section of the tunnel that Wyse proposed digging through the mountain ridge at Culebra, across the continental divide. The Congress, Nichols noted in his comments on the right side, considered five modifications to the Wyse plan, four of them having to do with a greater or lesser length to the tunnel. The fifth variant, ultimately approved by the Congress, was for an open cut through the mountain, eliminating the tunnel altogether. A.B. Nichols’ study of the original French plan of 1879 for a sea-level canal with a tunnel through the mountains. From A.B. 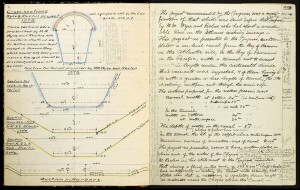 Nichols’ Notebooks.